Why forestry field studies? As experienced teachers of scientific ecology and forestry concepts, we believe that a forest or woodlot can provide teachers and their students with the perfect laboratory for understanding some of the basic principles of environmental science and community ecology. These studies were designed and used for many years as a unit in an advanced placement environmental science course. They also could be used as a lab in a biology, botany, forestry, or ecology class at the high school or beginning college level. They place students in a natural environment collecting real data to better understand a real place, something sorely lacking in most high school or beginning college curricula. 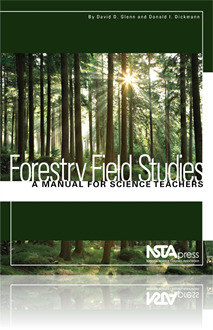 This manual is organized to systematically take a teacher through a comprehensive set of field exercises, from preparation to written report. We begin by discussing some basic ecology and forestry principles in Chapters 1 and 2. These discussions are meant to be a “refresher course” and do not cover these subjects in a textbook, encyclopedic fashion—for that see the chapter bibliographies and readings listed in Appendix E. In Chapter 3 we cover some necessary pre-fieldwork preparation. Chapters 4 through 7 describe the actual fieldwork and are essentially units of an all-day session in the woods. If time, budget, or logistics do not permit an all-day field trip, however, one or more units can be chosen to fit a particular situation—we do not intend these exercises to be all or nothing! We conclude with a discussion of the post field trip data analysis, report writing, and wrap-up.